Automatic Controls of VA., Inc came into existence in 1973 through the owners William and Ruth Hoitt’s desire to grow a business for their family. ACOVA has grown from a 2000 sq ft office to now operating out of a 30,000 sq. ft. facility in Ashland, VA. We are a manufacturer’s representative for over 30 lines in the industrial process equipment field. A need for faster receipt of machined parts to sell complete assemblies to its customers led Mr. Hoitt to open Valve Automation Center in 1989. 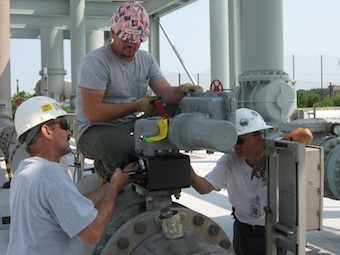 Valve Automation is now one of the leading companies in its field servicing and troubleshooting Emerson product installations. Mr. Hoitt has retired and his business acumen continues with his children William Hoitt, Jr, Greg Hoitt and Susan Thweatt at the helm. Automatic Controls of VA., Inc and Valve Automation Center, now a division of ACOVA, continue to provide a quality product and excellent customer service as they realize their customers are their most valuable asset.